Hanna Yaffe is a musician and storyteller based in Jerusalem. 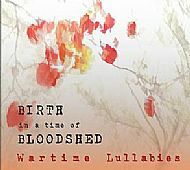 Her project, Lullabies of Loss, includes the international lullaby collection, "Birth in a Time of Bloodshed", which consists of 18 songs, sung in their original languages from across the world. Christina's contribution is "Bà Bà mo Leanabh Beag" a Scottish Gaelic lullaby from the time of the Potato Famine in the mid1800s, which famously devastated rural Ireland before hitting Scotland and destroying the main food supply of the ordinary people. Sometimes sung in the style of a waulking song, this version is more restful with cello accomaniment by Jo Baird, who also collaborated with Christina on the "Haunting" album. For a full version, please click on the album cover above and download the track from the Lullabies of Loss website. "Birth in a Time of Bloodshed" is a poignant expression of shared humanity. In it, though, you will hear anger, despair and fear. Each song is the voice of a mother in a time of hardship and loss, encapsulating powerful themes of war, famine, exile, persecution and slavery. The compilation comprises examples from Russia, the Spanish Civil War, Vietnam, Germany, Iraq, the Netherlands, Kenya's Mau Mau rebellion, Lithluanian Ghetto, Palestine, South America, the Israeli War of Independence, First World War Galicia, Belgium, Italy and Armenia.